Johannes Brahms (7 May 1833 – 3 April 1897), was a German composer and pianist, one of the leading musicians of the Romantic period. Born in Hamburg, Brahms spent much of his professional life in Vienna, Austria, where he was a leader of the musical scene. In his lifetime, Brahms' popularity and influence were considerable; following a comment by the nineteenth-century conductor Hans von Bülow, he is sometimes grouped with Johann Sebastian Bach and Ludwig van Beethoven as one of the "Three Bs". Brahms composed for piano, chamber ensembles, symphony orchestra, and for voice and chorus. A virtuoso pianist, he premiered many of his own works; he also worked with the leading performers of his time, including the pianist Clara Schumann and the violinist Joseph Joachim. Many of his works have become staples of the modern concert repertoire. Brahms, an uncompromising perfectionist, destroyed many of his works and left some of them unpublished. Brahms was at once a traditionalist and an innovator. His music is firmly rooted in the structures and compositional techniques of the Baroque and Classical masters. He was a master of counterpoint, the complex and highly disciplined method of composition for which Bach is famous, and also of development, a compositional ethos pioneered by Joseph Haydn, Wolfgang Amadeus Mozart and Beethoven. 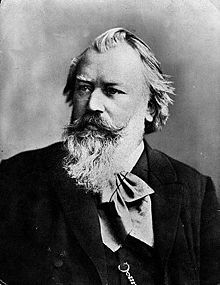 Brahms aimed to honour the "purity" of these venerable "German" structures and advance them into a Romantic idiom, in the process creating bold new approaches to harmony and melody. While many contemporaries found his music too academic, his contribution and craftsmanship have been admired by subsequent figures as diverse as the progressive Arnold Schoenberg and the conservative Edward Elgar. The diligent, highly constructed nature of Brahms's works was a starting point and an inspiration for a generation of composers. Click here to view all items related to Johannes Brahms.